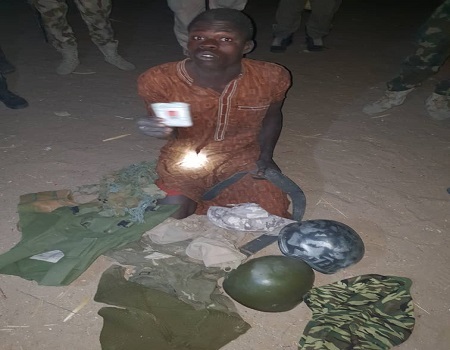 The Nigerian Army on Friday revealed that it has arrested a suspected Boko Haram terrorist, popularly known as Babagana Abubakar (aka Alagarno), who was declared wanted some months back. The Army’s claim was contained in an electronic release signed by the Director of Army Public Relations, Brig-Gen. Sani Kukasheka Usman posted on its official facebook (HQ Nigerian Army) and its official Twitter handle @HQNigerianArmy. The statement noted that the suspect was arrested at Bulabulim Ngarnam community on the fringes of Maiduguri in Borno State. “Gallant troops of 7 Division Garrison, carrying out cordon and search operations in conjunction with troops of 195 Battalion, Mobile Policemen and CJTF in some parts of the fringes of Maiduguri, today (Friday) discovered and arrested a wanted Boko Haram terrorists group member called Babagana Abubakar (aka Alagarno), hiding at Bulabulim Ngarnam community,” the statement said. Usman further explained, “He was found hiding in a room in possession of two military ballistic helmets, a pair of military desert boot, a fragment jacket, a jersey pull over, military backpack, camouflage design shorts, two voter identification cards, national identification card, amulets, camouflage T-shirts and military jungle hat.